Finally forced to choose between her marriage to Mike and a future that includes their beloved only child, Avery struggles to heal the rift that is tearing her family apart. To do that, she must risk everything she cares about, confront the sorrows of the past, and rediscover the love that once bound her family together. Avery must reach out to her husband and daughter to forge a bright new future—and she must do it through a simple gift conceived in love. This is truly a wonderful story about family tradition and love. This is the first time I read a novel by Karyn Witmer, but it won’t be the last. —Sheila, a reader. My family’s Christmas tradition isn’t like anyone else’s. It isn’t making Christmas cookies. It isn’t going down to Klein’s Department Store and having your picture taken with Santa. It isn’t decorating the tree on Christmas Eve. Our Christmas tradition is different. It is a Christmas cactus that has been passed down in my family for over a hundred years. It’s a big plant with these flat, lumpy branches. It has long pinky-red flowers that hang down like bells, or like the skirts that fairies wear. It is really pretty when it blooms. I guess that’s why we’ve kept it all these years. My great-grandmother Letty got it as a special gift from my great-grandfather Gill before he went away to war. Great-grandmother Letty gave my Grandma Ada a pot with a piece of the special Christmas cactus in it when she said she’d marry Grandpa Tom. My grandma gave my mother a plant grown from the Christmas cactus the very same night she met my papa. Someday I’ll get piece of my family’s Christmas cactus. I’ll water it and give it plant food, and re-pot it when it gets too big. I’ll take good care of it, so when my daughter is grown, I can give her a Christmas cactus, too. Avery Montgomery’s life changed in the checkout line at the Food-4-Less, right between the Bounty paper towels and the Heifitz Hamburger Dills. “You got coupons, Avery, honey?” the checker asked. Avery flashed the woman a smile and dug into the side pocket of her purse. She’d gone to high school with Loretta McGee; Loretta Polk she’d been then. They were awarded their diplomas at Larkin High two students apart—Parrish, Pettigrew, Pignoli, Polk. Loretta had been so pregnant that afternoon not even her graduation gown had been able to camouflage her condition, and she’d been married to Sam McGee before most of the senior class had recovered from their graduation-party hangovers. Avery handed Loretta a fistful of coupons and glanced past the woman’s care-weathered features to the people lined up at the next checkout. A burley man in a red plaid shirt jammed change into the pocket of his jeans and grabbed up the twelve-pack of Budweiser like he wanted to get home to his TV for the second half kickoff. As he turned toward the door, Avery caught sight of the checker at the next register. She was new to the Food-4-Less, sharp-featured and bony in the way kids consider provocative these days. With her birdsnest of raspberry-purple hair and the silver studs inching up the curve of her ear like a metallic centipede, she wasn’t the type of girl Gill Matheson usually hired. Then, as the new checker turned to greet her next customer, her gaze caught—and held—Avery’s own. In that instant, a shock of recognition thundered through Avery. The air in her lungs went vaporous and thin. Cold doused her. A maelstrom howled in Avery’s head, as years of cherished memories swirled past her eyes. Instinctively she reached back, seeking her husband’s hand. Mike was there, just like always, clasping her fingers in his own, pressing his thorny thumb into the hollow of her palm. Holding her together. “It’s —it’s her!” Avery whispered. It was their daughter Fiona—Fee who’d run off eighteen months before to tour with Jared Hightower’s rock band. Deep inside the fragile vessel where Avery had stored up every dram of her anguish and fear for her daughter abruptly burst. Thick, sweet relief spilled through her chest and belly. Then, Fee shifted her gaze to her next customer. Without the intensity of that contact, Avery wavered, then felt her husband steady her. Every morning since her daughter ran away, Avery had risen from sleep with a hot, nameless dread squirming in her chest. For an instant she couldn’t remember why that was, then she’d see Fee’s photograph on her night stand, and it gave that dread a name. It gave it substance and form and urgency. It stirred up grief that lay like a burden on her heart, a weight she carried around with her no matter what she did or where she went. Avery had spent every day since Fiona left listening for the phone to ring, waiting for one of her daughter’s infrequent emails to arrive. Every night she’d scurry back to the house where she and Mike and Fee had lived together, open the door hoping—then stand staggered by the emptiness. Not once in all those months had Avery closed her eyes at night without wondering where Fiona was and if she was well and safe. It’s going to be all right now, Avery told herself. Now that Fee was back in Larkin, Avery would find a way to make it right. She drew herself up tall and fought to find her balance. She needed to go to her daughter, clasp her hands around those bony shoulders, and smooth that haystack hair. She needed to kiss her daughter’s cheek and seek the child she’d lost in the body of this stranger. “Thanks,” Mike said and shifted his grip to Avery’s elbow. He steered her down the checkout lane, propelled her past the row of teenaged baggers, and through a clot of abandoned shopping carts. Fiona didn’t so much as glance their way, concentrating instead on the queue of Sunday afternoon customers backed up at her register. The door into the parking lot whooshed open before them. The toes of Mike’s work boots nudged the heels of her pumps as he urging her through. He bustled her down the ramp and across the blacktop to where his midnight blue Silverado was parked. Any other time Avery would have resisted, but she was too shaken by seeing her daughter and too unsure of what she should say to her to pull out of Mike’s grasp. Over the years she’d trusted Mike to do what he thought was best for her, to do what he thought was best for all of them. So she let him hand her into the cab of the truck. She waited for him to stride around to the driver’s side. She was almost afraid to believe what she’d seen, to believe that the terrible months of anxiety were over. Avery looked up into her husband’s angular, sun-browned face and tried to gauge his reaction to unexpectedly encountering their daughter. Mike reached out and took her hand. Casey DeCristo had been Fiona’s best friend ever since the day her daughter had been summarily promoted from second to the fourth grade. She’d arrived in Mrs. Lapp’s classroom a scrawny, fierce-eyed seven-year-old. Fee had already figured out that being smarter than everyone else made you a freak and wanted her classmates to know she wasn’t going to let them bully her. But that first day at recess Casey, who was a pretty, popular, self-possessed ten, had gone out of her way to befriend the younger girl. That simple kindness had forged the kind of friendship that was going to last all their lives. Since then, the two girls had ridden bikes together, tried out for school plays together, “eewed” through dissections in Biology class together. They’d had sleep-overs at each other’s houses, baked countless pans of butterscotch brownies, and gone off to band camp arm in arm. Fee and Casey had shared clothes and worries and girlish secrets. Then, in the middle of their junior year of high school, Casey had met and fallen in love with Dan DeCristo. From that day on, she and Fee had set about making very different lives for themselves—but their friendship had never wavered. The tiny little house mere blocks from where Fee had grown up, from where she and Mike were living now. Her husband slid an arm around her shoulders and pulled her toward him across the seat. He wrapped her against him, drawing her close. She nestled into the hard breadth of that workingman’s body, breathed the tang of freshly sawed wood that was so much a part of who he was, and closed her eyes against the sting of tears. He stroked his hand the length of her ruddy-brown braid, feathered kisses against the faint crease that had formed between her brows. He hugged her close, and Avery indulged herself in the comfort she’d always found in her husband’s strength. “Fee’s always insisted on having things her own way,” he murmured. As if that explained why Fiona had kept her return to Larkin a secret, as if he could accept the pain not knowing caused. But even as mildly as he’d spoken, Avery heard the edge in his voice. Because Fee had always been her daddy’s girl, Mike had been angry and deeply hurt by the way she left. After all these months of silence, Avery didn’t care what Fiona wanted. She didn’t care that Mike was advocating caution in approaching her. Right now Avery knew exactly where her daughter was, and she meant to have a word with Fee before she slipped away again. Avery lifted her head from her husband’s shoulder and looked up into his deep-blue eyes. Her gaze skimmed the angle of his long jaw, touched the sprinkling of gray in his dark hair. “Thank you,” she whispered. She eased out of his arms and reached for the door handle. “What are you doing?” Mike demanded and caught her arm. If Avery hadn’t been looking at Mike directly, if she hadn’t known his face as well as she knew her own, she might have missed the faint shift in his expression. She might not have seen the nearly imperceptible tightening at one corner of his mouth, the shadow that crept into his eyes. Summary: In the college town of Larkin, Kansas, Avery Montgomery is surprised when she sees her daughter, Fiona, working at a supermarket. Eighteen months ago, Fiona left town to tour with her boyfriend’s rock band. Avery has heard little from her daughter and had no idea she was back in town. Avery’s husband, Mike, is still furious with Fiona. “Avery and Mike have worked hard their whole married lives to form the perfect couple. Their daughter Fiona was the welcome addition to create an ideal family. She is close with both her parents, sharing her day to day life with her mom and hours with her father in the amateur observatory they built together. It is the life they always dream, the one they both wanted after their own difficult childhoods. But all their dreams are shattered when Fiona runs away with her boyfriend and their rock band. It seems irretrievably broken when after a year and a half, not even knowing she has returned, her parents run into her working at an area grocery store. Avery’s business takes off with an unexpected order for 50,000 of one of her stuffed animals. She must cope with the business details, her aristocratic mother, and her stubborn husband. While Avery tries to build a tenuous relationship with her daughter, Mike is too hurt to even consider reuniting with his daughter. This fissure causes a break in Mike and Avery’s marriage as neither can accept the other’s point of view. Mike moves to the family farm to support his alcoholic brother and brood within the observatory that reminds him so much of the good times. 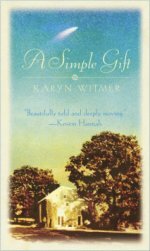 Karyn Witmer has written a story of the depth of family love, both that between husband and wife and between parents and children. It also examines the relationship between husband and wife as a separate relationship from family. It is a difficult concept for many couples, an important part of themselves that needs acceptance and nurturing. She includes two love scenes of Avery and Mike that highlight the love, both emotional and physical, that continues to exist between couples of all ages. By interweaving the stories of previous generations with the events of the present, Witmer portrays the effects of the past on the relationships of the future. It is a book of acceptance, forgiveness and the meaning of family. It is not a surprise to learn that this book is being issued in paperback in September 2006. It should coincide with Christmas reading lists and will be a wonderful addition to holiday reading. The Simple Gift will start new holiday traditions in many families for years to come. “There are some books you just read and some books that you savor. A SIMPLE GIFT is one book to cherish. It begins with the simple gift of a blooming Christmas cactus, passed down through four generations of the women in one family. While the story is reflective of each generation’s trials and tribulations in the lives they’ve lived and choices they’ve made, it is Avery, her husband, Mike, and daughter, Fiona, who are showcased here; a story where sometimes the simple gift of unconditional love turns out not to be all that simple. A SIMPLE GIFT is not just a simple gift to readers, either, especially those who relish emotional, often times heartrending stories. It’s an extraordinary gift from a phenomenal author that you won’t soon forget. With A SIMPLE GIFT, Karyn Witmer has penned a deeply moving, emotionally charged story that reflects each character’s viewpoint and showcases every facet of a once close knit family now in turmoil. The synopsis above says as much as you need to know as to the theme of A SIMPLE GIFT. What it doesn’t tell you is how poignant and eloquent is the prose in which it is written. I could go on all day listing adjectives to describe Karyn Witmer’s writing, but sometimes perfection can be indescribable. And that’s what this book truly is. Indescribably perfect. Inspirational. Unforgettable. So much of a satisfying read, that I read it complete in one sitting, a box of kleenex by my side, and thought about the story and characters for several days afterward. Karyn Witmer isn’t a new author, just in case you don’t recognize her name. She also has written some lovely historicals under the pen name Elizabeth Grayson, many of which feature the same character depth and emotional range as this contemporary story has. I’m so happy to see that this author’s venture into the contemporary world seems not to have affected her writing one bit.